Four Paws Pinotage is now available in the UK. 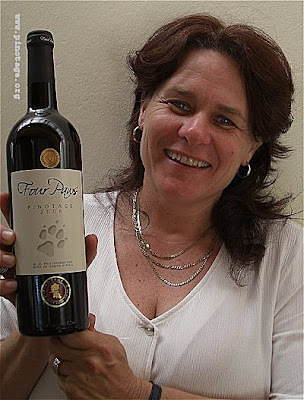 Four Paws is owned by Anne Jakubiec (pictured left) and the maiden 2006 vintage Pinotage shot the label to fame by achieving a 2007 Pinotage Top 10. Trevor Mayor of Great Wine UK Ltd tells me that he has now received shipments from South Africa of that winning 2006 Pinotage.